My kids love Spongebob. I have to admit, it's not a bad show. One episode involves Spongebob and Squidward working the night shift at the Krusty Krab. Squidward scares Spongebob with a spooky tale, which of course starts to come true. It turns out just to be their imaginations of course, but someone has been flickering the lights - who could it be? Oh, it's just Nosferatu! It's a sign of an icon when 80 years after a character is first created, he's seen as part of a gag on a kid's cartoon. 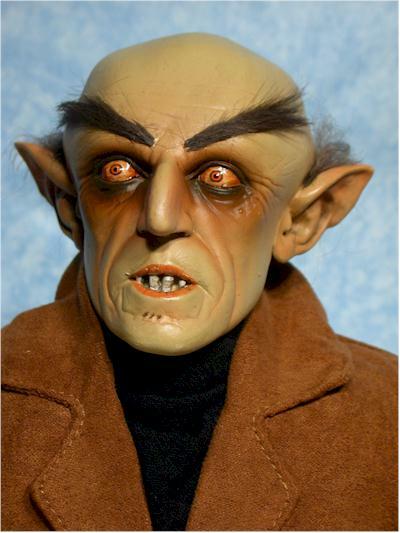 That's Count Orlok for you, the first film vampire to scare an audience. 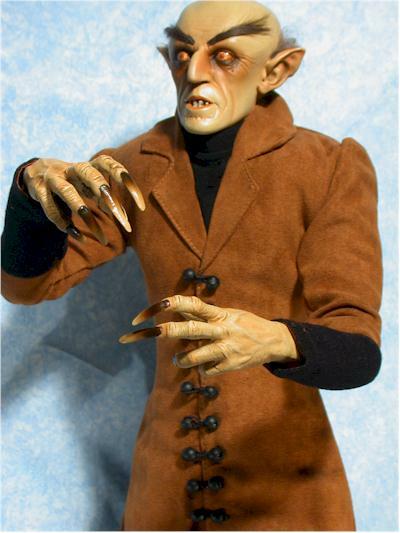 Sideshow Toy produced a terrific 12" version of the dear old Vampyre (and still have a black and white version available), and have now shipped the 18 version of the Count. 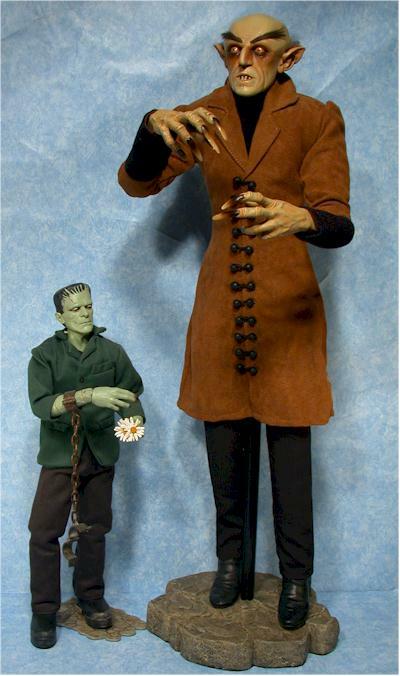 This is the first of their new 1/4 scale line, and they have a fantastic Karloff Frankenstein already up for pre-order with plans for an 18" Hellboy as well. the final run size for Frankie hasn't been announced yet, I'm betting it will be quite small as well. he could break. So it's no little wimpy box for him, but a massive, black, rectangle of a package. it's not something you'll want to display. Take him out and make some shelf space! The head, hands and boots are all sculpted and cast in polystone. The boots look fine, but unless you're one of the Fab Five, it's unlikely you'll get too excited. I mean, they are just boots. The head sculpt is excellent, with plenty of fine detail and statue/bust quality in both the design and the execution. 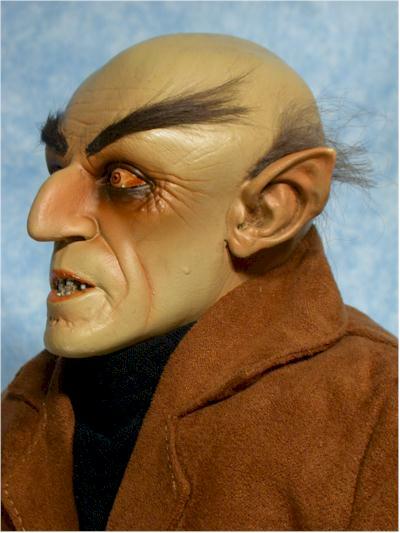 The hairand eyebrows are realistic, glued to the head in an unobvious fashion. This works well, particularly in this scale where sculpted hair may have been out of place, and lacked the 'wild' appearance this figure requires. The hand sculpt is the most amazing part of the overall figure though, with fantastic detail and great design. 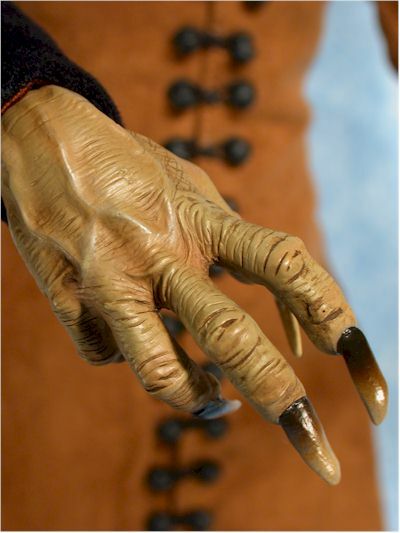 The long fingers and fingernails, along with a great, spooky positioning of the fingers, makes for a menacing appearance in any pose. It's also very worth pointing out just how huge this figure is. Yes, that's a 12" Frankenstein standing next to him down there. 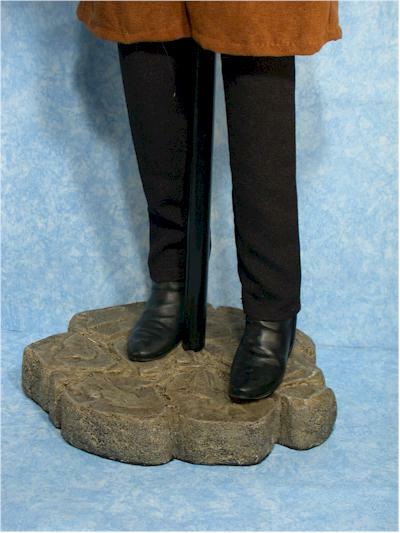 With the additional height of the polystone base, this figure stands almost twice as tall as the usual sixth scale figure. Better have lots of headroom on his shelf! I had a particularly tough time grading this category on this particular figure. There's nothing actually wrong with the paint application, at least not in terms of quality or neatness. But there's something nagging me, and I can't quite put my finger on it. As I said, quality is excellent. All the lines are clean and neat, with no bleed between colors, over spray or unevenness. Details are highlighted, and the sculpt is enhanced, rather than detracted, by the paint application. The top coat is a tad shiny though, giving the piece a more 'sculpture' look, rather than a 'realistic' look. At this scale, I'd really like to have the figure look as much like the actual Count as possible, and the shine took away some of that realism. He also has a bit of a zombie appearance. Yes, I know, he's a vampire, he looks like a zombie, har har, isn't that funny. But you know what I mean - the paint seems to make he slightly more expressionless, and therefore a little less menacing. While the quality is great overall, I had to dock the paint ops slightly for these reasons. This category depends on your opinion on the style that Sideshow has used for their very large scale figures. They don't have the usual articulated body underneath, but rather have a wire armature with a padded soft body over it. Okay, so you're thinking Wampa or Chewbacca, aren't you? Well, this is a much higher quality than those, although the theory is the same. The bodies are well padded, but have the perfect proportions, and the wire armature is sturdy and should last a long time with repeated use. You can put him in just about any position, since just about any point on his arms and legs can be bent. The figure can't stand on his own though, since the polystone head is so heavy. His feet are simply too small to hold up such a heavy melon, so you'll need to employ the included stand. The outfit isn't particularly complex, but the quality of the materials and the tailoring are extremely good. There's not a lot to the outfit. There's the upper suede coat, which is the overall hightlight. The soft material, great tailoring, and excellent quality right down to the last detail make this the visual standout. There's also the paints, and the black dickie. It's not a real shirt - it's just a dickie. The other major item in the soft goods category is the body itself. I mentioned this with the articulation, but it's worth mentioning again that the padded body is very well made, and very well filled. The proportions are great, and without handling the figure you'd never know it wasn't a regular articulated body underneath. There's really only one accessory, the polystone base/stand. It works great, and is a 'crotch' stand. It's extremely heavy, and very solid. It works quite well, although it's not too large. While this is sort of a Brundle-fly design - blending of sculpture with action figure - I still would have liked another accessory or two. The suggested retail (and the Sideshow price) on this figure was $150. That's three or four of their 12" figures, and certainly not cheap by any standard. However, with an extremely low run, and some amazing detail in both the sculpting and outfit, they've taken their normal figures to a new level. This price point isn't for everyone, but the Vampyre, and the Frankenstein to come, are a new style of collectible figure, as much statue as action figure. I'm happy I picked this up, but I'll be the first to admit it's not for everyone. You have to be a pretty die hard Universal Monster fan to cough up the Benjamins. The 12" version is certainly good enough for most, and is a wonderful figure in it's own right. 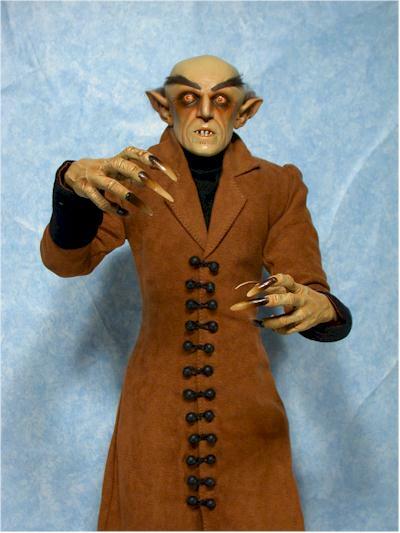 But if you're a big fan of Nosferatu, this guy will be the focal point of your collection. - Aisle Sniper has him in stock for $145, and they have the Frankenstein up for pre-order for $205. - Entertainment Earth have them in stock as well, at the suggested retail of $150. Just search for 'vampyre'. - and while they don't have this particular figure, Time and Space Toys has a big sale on a bunch of Halloween related figures right now, and they are giving away a Great Pumpkin Charlie Brown with every order. They do have quite a few of the 12" Sideshow monsters at good prices.